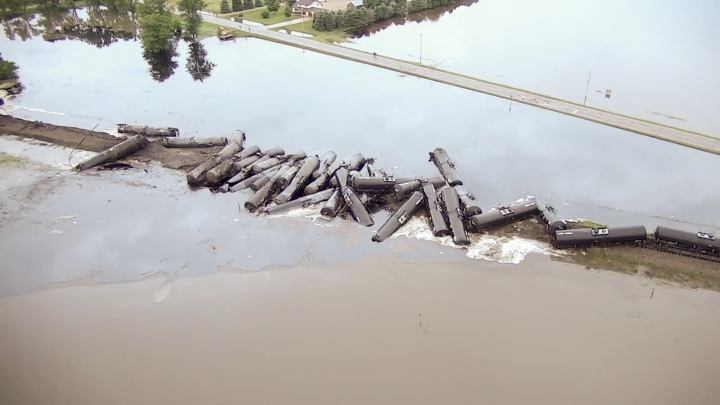 A railroad official says 14 of 32 derailed oil tanker cars in the northwest corner of Iowa dumped an estimated 230,000 gallons (870,619 liters) of crude oil into floodwaters, with some making its way to nearby rivers. The railroad will focus on environmental recovery. Williams says "ongoing monitoring is occurring for any potential conditions that could impact workers and the community and, so far, have found no levels of concern." Iowa Gov. Kim Reynolds is set to visit the site of an oil train derailment and oil spill in the northwestern corner of the state. Reynolds' office says in a news release that she plans to survey the site Saturday afternoon. The governor is also spending the day touring other areas hit by flooding in recent days. The derailment of 32 oil tanker cars Friday just south of Doon has caused concern for towns and cities downstream, as far south as Omaha, Nebraska, about 150 miles from the derailment site. Omaha's public water utility — Metropolitan Utilities District — is monitoring pumps it uses to pull drinking water from the Missouri River. Crews are working to clean up a BNSF oil train derailment in Iowa that dumped crude into floodwaters, while officials seek to get a handle on the extent of the spill and its cause. BNSF spokesman Andy Williams says 32 oil tanker cars derailed Friday just south of Doon, leaking oil into surrounding floodwaters from the swollen Little Rock River. He said Saturday that the cause of the derailment hasn't been determined. The amount spilled also isn't yet known. Williams says crews have been skimming oil from floodwaters. They're also building a road parallel to the tracks to try to get to the derailed and partially-submerged oil cars.